Naeem’s platform focuses on helping student utilize services and resources on campus and breaking down any barriers that students might be facing. “My campaign focuses on empowering students by opening grants, funding opportunities for student leaders, entrepreneurs for students who are willing to represent Laurier,” Naeem said. For Musa, entering the campaign period brings about both feelings of nervousness, but also a sense of calm. “I’m feeling okay. I thought i’d be a little bit more nervous than I am right now, but after the whole meet-ing and everything I actually really believe that I might have a chance at this, so I am feeling calm — for now,” he said. Musa’s platform focuses on enhancing resources on Laurier’s campus, for example, looking into stronger WiFi connections for students. “We can do much better so that’s definitely something that I wanna look into as president and see if we can get a better connection going on, maybe even for a better price. The usage of resources [on cam-pus] is really a key thing on my platform,” Musa said. Each year, encouraging more students to be engaged, involved and to cast their vote during election season is a goal for the Students’ Union. Last year, approximately 22 per cent of the student body voted. Of those votes, current Students’ Union president and CEO, Tarique Plummer, received 52.35 per cent of the votes. “I think the four candidates we have … we have a second year candidate and a Brantford candidate, the voter turnout will come from the diversity of demographics on campus,” Hakim said. 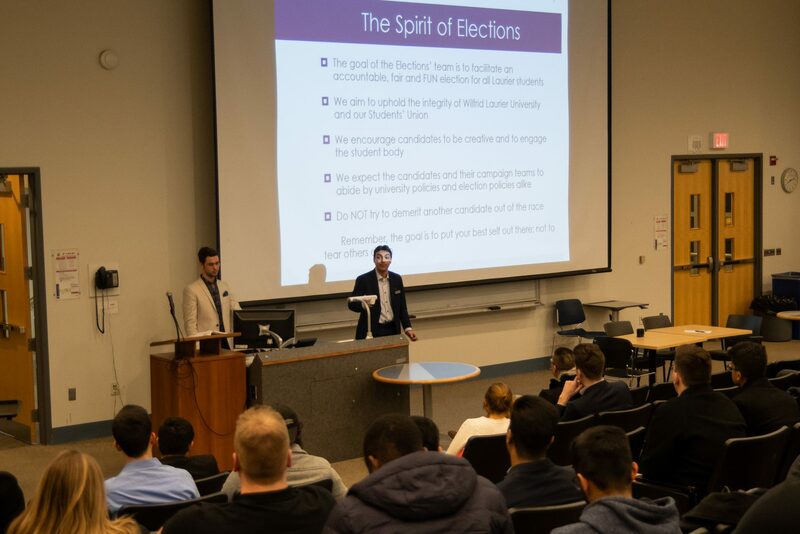 As well, as the Students’ Union strives to inform more students of how their vote impacts their experi-ence at Laurier during their time as an undergrad will, hopefully, also contribute to a higher voter turnout. “[Students] feel as though the president they’re voting for can’t actually do anything for them. The reality is that we can actually do a lot for them … so just getting the knowledge out there or the idea out there that we can make a difference.” Musa said. Most importantly, candidates aim to advocate for the issues and topics that students care the most about. “When it comes to voter turnout, is that people vote when they’ve spoken to you or heard from you, when they’re involved or engaged or there’s a issue that they care about,” Wojtanowski said. Campaigning will be taking place over the next few weeks and will end at 7:30 a.m. on Jan. 22, 30 minutes prior to when voting polls open. Voting will then take place on Jan. 22 to 24. Results will be announced on the evening of Jan. 24. “Everyone here can make a difference just by making their voice heard. So if you’re not voting, I’m sorry, but you’re just really losing out on the opportunity to make an actual difference — you’re going be leav-ing a legacy here. In order to do that, you got to make a few moves and make your voice heard,” Musa said.